Drawing 13 shows the same design as drawing 3, but the door on the north side of the room has been omitted. Had it been included, this door would have led into the Branch Bank offices. The perspective fails to reveal how the room was top-lit, whether by a skylight or a lantern. 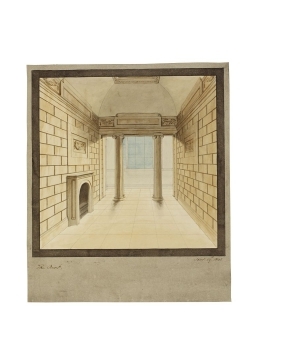 Soane exhibited a drawing of the Discount Office lobbay at the Royal Academy in 1809. The drawing, entitled 'View of the anti-room to the Discount office in the Bank of England' was probably drawing 13.